Having completed the purchase and setup of my mobile phone I returned my attention towards planning my tour. Making the reservations for the crossing to Islay and back had gone very smoothly, a few days after completing the bookings the tickets arrived with the post. 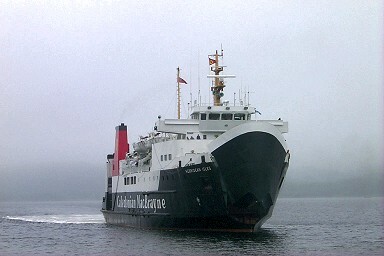 So I returned to the Caledonian MacBrayne website to book the crossings from Skye to Tarbert/Harris and from Stornoway/Lewis to Ullapool on the Scottish mainland. After checking the timetable I booked the crossings which suited me best and again two days later the tickets arrived in the post. This is how booking over the internet is supposed to work, quick and easy. I now had almost all of the ferry crossings booked, the only one I was still thinking about is the one from Mallaig to the Isle of Skye. But first I had to think about accommodation in a few places: I ordered the Information Pack from Shetland Islands Tourism and visited the website of the Orkney Tourist Board to download the accommodation guide as PDF-file. For both islands I contacted the hotels I selected via email to complete the reservation, which worked very well. On Shetland I will stay in the Sumburgh Hotel at Sumburgh Head, near the Jarlshof Archaeological Site. For Orkney I decided to stay in Kirkwall, in the Royal Oak House. Now it was time to try to return to a place where I had stayed before: Kinloch Lodge on the Isle of Skye. 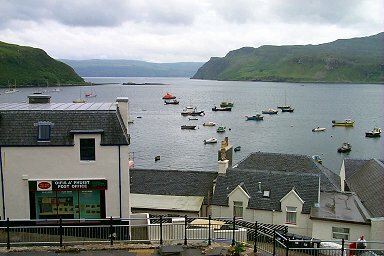 I had stayed here during my first visit to the Isle of Skye in 1999 and had enjoyed it very much. As the lodge is very popular I wasn't very confident that they would still have a vacancy. To my surprise Mrs MacKinnon still had a room available for me. I was able to book a room with a view of the Cuillins, which sounds very promising. In particular I'm looking forward to the dinners: Lady Macdonald (who runs the lodge with her husband, Lord Macdonald) is an excellent cook and has published several books with her recipes.